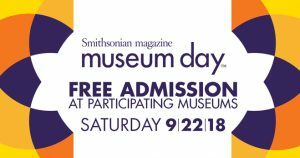 Mobile, Ala.—Mobile Museum of Art will open its doors free of charge to all Museum Day ticketholders on Saturday September 22, 2018 as part of Smithsonian magazine’s 14th annual Museum Day, a national celebration of boundless curiosity in which participating museums emulate the free admission policy at the Smithsonian Institution’s Washington DC-based museums. Mobile Museum of Art (MMofA) includes a permanent collection of close to 10,000 works of fine and decorative arts from America, Asia, and Europe. This collection spans periods from classical antiquity to the present day. MMofA is supported by a unique public/private partnership of city and community support. Its facility is owned by the city of Mobile, and the art collection is privately owned. MMofA’s collection exhibitions Asian Art, NATIVE AMERICAN ART: From the Collection, Our People, Our Places, Our Collection, and Serious Whimsy, Serious Play will be on display as well our special exhibition art:WORK.